Designed for concrete contractors who want to achieve the highest application performance and who value the best quality, the self-levelling Leica Rugby 810 horizontal laser offers the ultimate levelling solution, completed by the unique power concept, unbeatable ruggedness and the highest accuracy. 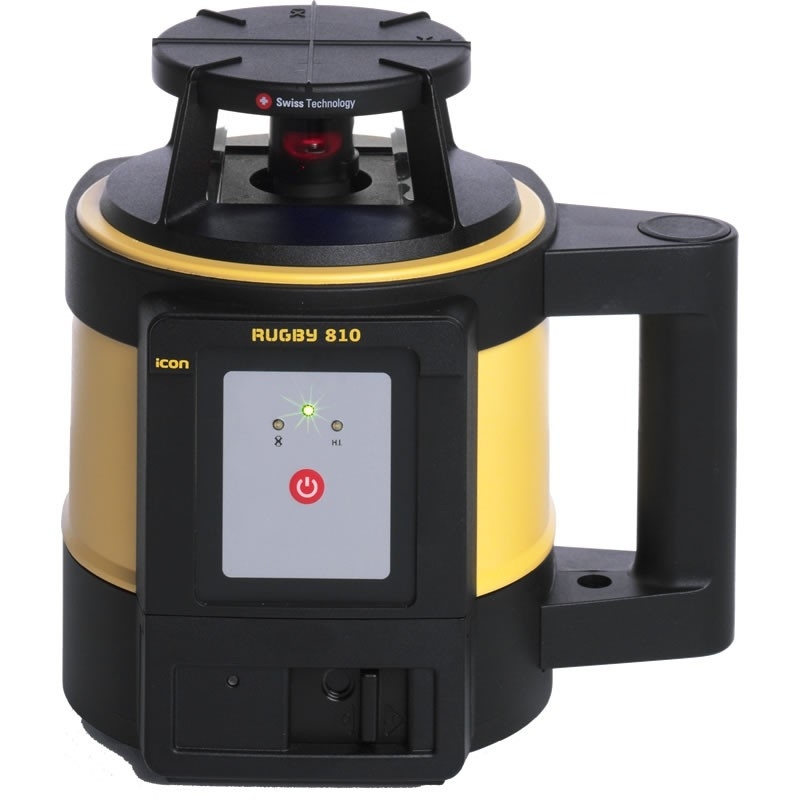 Extremely easy-to-use, one button Leica Rugby 810 laser level saves time and money by reducing preparation time and eliminating costly errors in levelling applications. Simple operation does not compromise on outstanding performance up to 1100 metres, highest measuring accuracy and reliability under any weather conditions. Simple in operation, Rugby 810 construction laser ensures that your concrete works and formwork levelling applications are always exact, easy and reliable. Take advantage of the unique and versatile power concept offered for the Rugby 810 rotating laser. The new generation of smart, Li-Ion battery technology enables contractors to work even longer hours and charge faster, lowering their operating costs. Assuring high flexibility, the Li-Ion battery can be charged on-the-go with the car charger (optional) or from any battery using the 12V connector (opt. ); and if needed, exchanged anytime to alkaline battery packs. Setting the standard in environmental-friendly energy management, Rugby 810 rotary laser can also be charged with the optional solar panel by attaching it to the carrying case. Work effectively 365 days a year with the Rugby 810, the most rugged and robust rotating laser level in the market. Proven by its IP 68 protection standard and the military grade certification, Rugby 810 provides the most reliable application performance.